Top label applicators are useful when higher volumes and Labeling on conveyor lines are needed. A sensor detects the product as it comes down the conveyor and triggers the application of the label at the proper time. Product handling must be tightly controlled to ensure accurate label placement. Applicator is fully synchronized with all operations including Product Feeder, Roll Winder and Label Dispensing for optimum Labelling accuracy; it also helps to change the Labelling speed online with the help of Single Speed Pot provided on control panel. Label applicators are available with unique single point synchronized speed control system. The Inbuilt Automated Label Length detection systems eliminates any need for manually feeding and storing of Label Length data in memory and retrieving the same every time for change of Label Size & re-starting the machine. This two type of machines are designed through multi-purpose labeling systems, and highly recommended with proven quality for front back application of multiple sizes, with just a simple adjustment. This kind of type is top labeling machine. 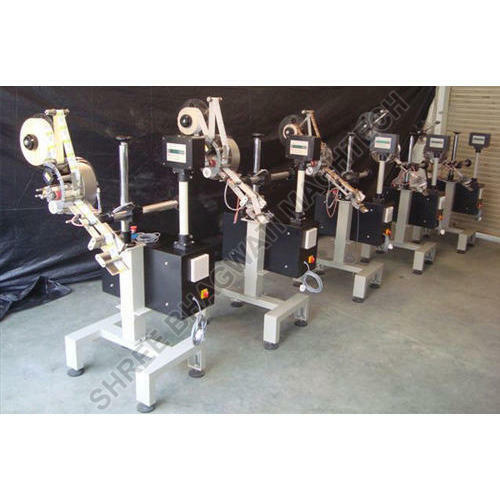 You can operate in line with assembly line or other packing line to get a high efficiency. Label applicators are machines that automatically apply printed labels to products. Labeler can apply a wide variety of label configurations to cases and cartons, increasing production flexibility and speeding changeover. The Print and Apply Model with Multi Panel Applicator features a stepper motor driven vacuum belt that stages the labels prior to application. This unique system smoothes the label application operation and helps in achieve high speeds.